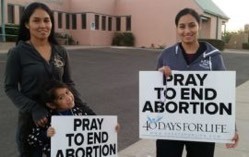 Day 1 of the 40 Days for Life Prayer Vigil, and Already One Abortion Worker Has Quit! But first, a mother in your community might be scheduling an abortion as you read this message. Thankfully, you're not helpless. Former abortion workers report that when there is someone praying in front of an abortion facility, the "no-show" rate for abortion appointments can go to as high as 75 percent! It's always easy to make an excuse not to go out and pray at your local vigil. We counted down the five worst excuses to not pray at your local 40 Days for Life vigil on this episode of the 40 Days for Life Podcast. Volunteers at one 40 Days for Life location didn't make any excuses to stay home from their local vigil. In fact, they decided to hit the sidewalk a week and a half before the campaign began. That makes 178 abortion workers to leave their jobs since the first nationally coordinated 40 Days for Life campaign launched in 2007. "PRAISE GOD," Andrea continued. "Our prayers are having an effect!" A year ago, 40 Days for Life campaign participants in Downers Grove, Illinois encountered a group of rowdy protesters who sought to discourage them as they prayed for abortion-bound mothers and babies in their community. The protesters created such a circus that even abortion supporters asked them to leave. As is typically the case, the effort to protest peaceful prayer fizzed. But the 40 Days for Life team presses forward. The Downers Grove kickoff event filled the public right-of-way and featured words from a local priest, the executive director of Illinois Right to Life and a pro-life musician. Lord, we ask for the strength, courage, wisdom, determination and stamina to carry out this mission according to Your will. Guide us, we pray, as we go forth and proclaim Your truth. Click here to visit the website and find out what city near you is hosting a prayer vigil. Subscribe for free to Breaking Christian News here.